Figure 13.38 below is a graph that shows the Maxwell-Boltzmann distribution of molecular speeds in an ideal gas for two temperatures, T1 and T2. Which of the following statements is false? The rms speed at T1 is higher than that at T2. The peak of each graph shows the most probable speed at the corresponding temperature. Figure 13.38 A graph showing the Maxwell-Boltzmann distribution of molecular speeds in an ideal gas for two temperatures, T1 and T2. This is College Physics Answers with Shaun Dychko. This graph shows the distribution of molecular speeds in a gas at two different temperatures. 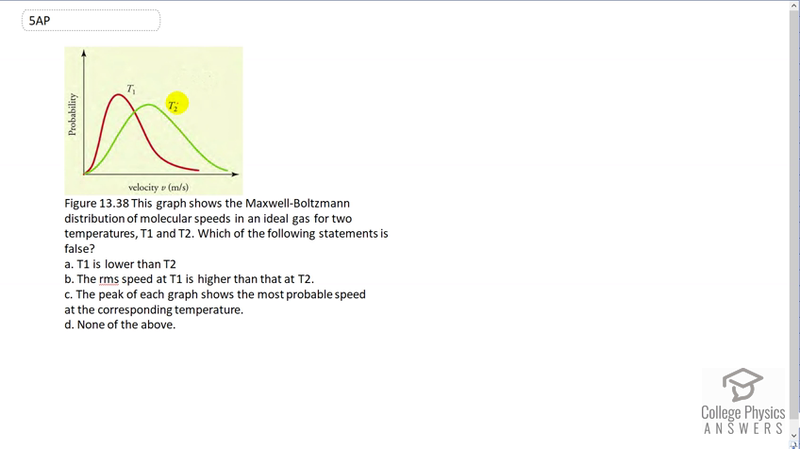 Now temperature two is going to be greater than temperature one because we can see that there are higher speeds in this distribution for temperature two. And the peak velocity of the most probable velocity is higher for temperature two than it is for temperature one. And increased velocity is evidence of increased kinetic energy of the particles and that is basically where temperature is measuring. So, we know that T1 is lower than T2. So T1 is less than T2 in other words. That's good. By the way, that's not our answer. We're just going to put a check mark beside that, so that is not false. The rms speed at T1 is higher than that at T2.That seems unlikely because at peak speed at T1 is lower than the peak speed at T2. Now, this point is higher than this point is but don't let that confuse you because the height, the vertical access in other words is just a measuring probability. And so, at temperature one it is more probable to find a molecule at the peak velocity than it is to find a molecule at temperature two at the peak velocity. That part is true, but nevertheless the peak velocity at temperature two is greater than the peak velocity at temperature one. And since the peak velocity at temperature two is greater than the peak velocity of temperature one, it also means that the rms velocity which is somewhere a little bit more than the peak velocity, it is Vrms for temperature two and here is Vrms for temperature one approximately. So that's the comparison there. And so the rms speed for temperature two is greater. So that means this is false. So that's going to be the answer to our question. But let's just confirm by showing that c is correct. The peak of each graph shows the most probable speed at the corresponding temperature. Yes, definitely. So there we go. All done.